Normally greens have a life span of between twenty and twenty five years. The fourth green has been there since 1976 and has celebrated its forty second birthday, If you take a careful look at it you will notice that it is riddled with native couch. This makes it very difficult to place the pin in suitable positions. Consequently, we have poisoned its surrounds in preparation of placing a new fescue protected green in the area. This will happen in the next couple of weeks so that the new green will be playable before winter arrives. The design of the new green was discussed at the AGM and there are a couple of diagrams up in the clubhouse. We have upgraded many of the facilities in the clubhouse over the past two years. Naturally we desire to make our clubrooms a place of comfort after a game but we also aim to encourage others to use our amazing facilities. Recently, the Berri Barmera Educational leaders used our club for their meeting and they have just booked it for a student free day function. Flinders University have booked us for a cocktail party for 70 people and another educational group have booked us for a whole week towards the end of April. 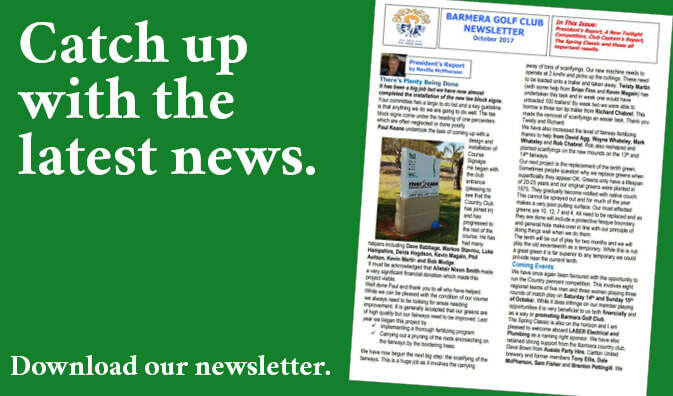 Barmera Food & Wine Club use it for their monthly events as do the Epicurian and Bistronian clubs. Enquire now for information, if you have an upcoming event. (With this in mind we still recognize the need to develop, not stagnate, and so we chose projects from our big picture plan that are less costly but still important. Extra Shedding for machinery in greenkeepers compound.